Raise device so it is at eye level and make sure you have correct posture. Standing and ergonomic desks are two great options for your screen. For your cell phone, if you can just hold it up higher, or if you can’t try to just look down with your eyes but keep your head straight. Get a good ergonomic chair. Make sure the height, seat depths, and armrests are all adjustable. Also, check that the chair can incline and decline with a locking function. Try to space out your tech time so you are not sitting in one spot for a really long time. Stretch on breaks and move around. 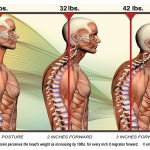 Here are some exercises you can do to prevent neck pain before it even begins. Drink 8 glasses of water a day. Keep a healthy lifestyle and exercise routinely. Warning signs that you may have tech neck include stiffness in your neck, headaches, pain between the shoulder blades, and numbness in your arms or fingers. If you have these, come see us at Fonke Chiropractic here in Cary to see if we can help.